Rahul Gandhi is the Member of Parliament of India for the constituency of Amethi, Utter Pradesh. Key Achievements: Member of Parliament of India from Amethi, appointed General Secretary of the All India Congress Committee in 2007, given charge of the Indian Youth Congress and the National Students Union of India in 2007, Took charge of the post of Congress Vice President in 2013. 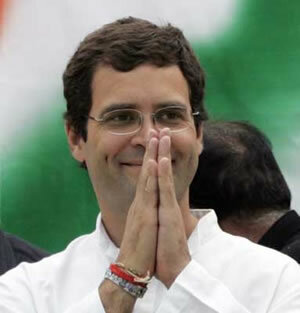 Rahul Gandhi is one of the most prominent names to emerge in the new millennium as far as Indian politics is concerned. He exemplifies the similar kind of charisma and charm that came to be associated with his father, the late Rajiv Gandhi. Rahul Gandhi was born on June 19, 1970 in one of the most influential families of the world at the time, the Nehru-Gandhi family. His grandmother was Indira Gandhi, who was the Prime Minister of India at the time of his birth. Congress President Sonia Gandhi is the mother of Rahul Gandhi, and Priyanka Gandhi Vadra is Rahul’s younger sister. Born in Delhi (now New Delhi), the capital of India, Rahul finished his elementary education and schooling in the city’s prestigious St. Columba's School. He also studied for two years at The Doon School in Dehradun, from 1981-1983. Rahul experienced his first feeling of bereavement in 1984, when his grandmother Indira Gandhi was assassinated following a period of nationwide unrest and agitation. In the aftermath of this event, his father Rajiv stepped up to handle the reins of Prime Ministership in the same year. For the next few years, Rahul led a fairly peaceful life, until his father's assassination in 1991. At this point, he was enrolled in Harvard University, Cambridge, to complete his undergraduate education, but he soon had to shift to Rollins College in Florida, due to security concerns. 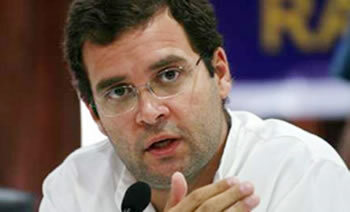 During this period, Rahul would assume the pseudonym of Raul Vinci in order to escape any kind of public or media attention. He earned his Bachelor of Arts from Rollins College in 1994, following which he decided to head back to Cambridge, to pursue a Master’s course in Philosophy from Trinity College until 1995. Having completed his education, Gandhi moved to London to work at the Monitor Group, a management consulting firm. After a brief stint in the U.K. capital, he returned home to become one of the directors of Backops Services Private Ltd., a technology outsourcing firm in Mumbai. As the news of Rahul Gandhi’s presence in the country spread widely, there seemed to be an air of anticipation across the country regarding his entry into the political framework of India. In March 2004, Rahul ended all speculations about his political aspirations by announcing that he would be contesting the May 2004 Lok Sabha elections. Following this announcement, the Congress party was galvanized into action, as it left no stone unturned in campaigning for a much desired electoral victory. Personally for Rahul, this decision was even more momentous as he was going to contest for his father’s former constituency of Amethi in Uttar Pradesh. Mother Sonia Gandhi understandably made way for her son to contest the polls, by transferring from Amethi to the neighboring constituency of Rae Bareily. The election results were a great source of elation for the Gandhi family, because the mother-son duo of Rahul and Sonia had not only registered individual victories, but also led Congress to a handsome win. Rahul Gandhi limited himself to being the Parliamentary representative of Amethi until 2006. The year 2007 brought mixed fortunes for the Gandhi scion. While he was handed the responsibility of reviving the youth politics in the country, he could not guide Congress to victory in the State Assembly elections of Uttar Pradesh. A heartening achievement for Rahul came in the same year when the membership of associations presided by him saw an increase of at least twelve times the previous number. These associations were the Indian Youth Congress and the National Students Union of India. He was given charge of these two organizations in the reshuffle of the party secretariat in September 2007. In the run up to the Lok Sabha elections of 2009, the Congress was challenged by the BJP to perform an encore of their 2004 success. Rahul, along with mother Sonia and sister Priyanka, campaigned actively for weeks at a stretch. At one point of time, he addressed as many as 125 rallies in a span of just six weeks. All the work paid off in a big manner, as Congress was elected by the people of India for a second consecutive term. On a personal front, it was déjà vu for Rahul, whom the people of Amethi chose once again over his rival, by a mammoth margin of 333,000 votes. Rahul Gandhi, like any other public figure from his family, has undergone spells of criticism, so much so that these criticisms were bordering on being acerbic. His remarks on the issue of Lokpal in 2011, the rumored WikiLeaks disclosure about his comments made on militancy during a lunch with Prime Minister Manmohan Singh and the United States Ambassador to India, Timothy J. Roemer, are prime instances of the flak he received. However, despite all the success and denigrations that have come his way, Rahul Gandhi is Congress’ best bet for the 2014 Lok Sabha elections. In fact, many believe Rahul Gandhi to be all but nominated as the Prime Ministerial Candidate from the Congress party in the 2014 elections.